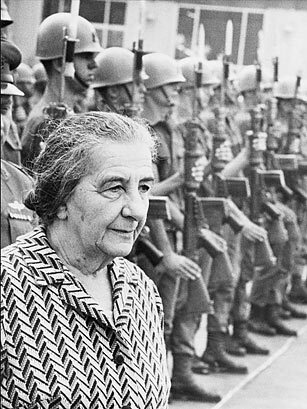 Once called "the only man in the Cabinet," Golda Meir was a formidable figure in Israeli politics. Tall, blunt and determined, she fervently devoted her life to the service of the Jewish state she helped found. After an illustrious political career, including service as Israel's Labor Minister and Foreign Minister, she took the country's reins as Prime Minister in 1969, when Israel was prosperous and still euphoric over its victory in the Six-Day War against Egypt, Jordan and Syria. But another war, just a few years later, would prove to be her downfall. Israel's lack of preparedness for the fourth Arab-Israeli war, called the Yom Kippur War, stunned the nation. Though Israel went on to win the war, with the U.S.'s assistance, the government was severely criticized. With much of the blame directed her way, Meir stepped down in 1974. Despite ending her life of public service under a cloud, there was never a question of Meir's faithfulness to her country. "There is a type of woman," Meir once said, "who does not let her husband narrow her horizon." See TIME's 1971 talk with Golda Meir.